BioEM2016: Thank you from the Presidents! The time for BioEM2016 is past, now just good memories remain. It was good fortune to have the annual meeting this year in such a beautiful place, Ghent in Belgium. All attendees could enjoy not only the interesting conference, but also the delightful weather, tasty foods, and especially the excellent beers and chocolates during our stay in Het Pand, a former Dominican Monastery. Meetings like this cannot be successful without the effort and dedication of the LOC members, TPC members, and BEMS Board/EBEA Council members. We really appreciated all attendees’ participation. Our special thanks to Luc Martens and all members of the LOC who worked hard and long hours to get all the arrangements in place in order for the meeting to run smoothly and successfully. We thank the Technical Programme Committee, chaired by Francesca Apollonio and Heidi Danker-Hopfe for this, as well as the dozens of reviewers of the abstracts for the very well-balanced and outstanding scientific programme. Thanks to the plenary speakers, the workshop convenors, and chairpersons, and also to the scientists who presented oral and poster papers. This year, the EMF-MED COST action supported the attendance of about 60 participants, including many young scientists: our warm thanks to Antonio Sarolic and Mirjana Moser for making this happening. On Wednesday morning, we had the plenary talk entitled ‘The US NTP Study: A real game changer or just another study?’ presented by Myles Capstick from IT’IS and Michael Wyde from NIEHS. Closely before BioEM2016 meeting, the NTP (National Toxicology Program) announced the partial findings of their study on the carcinogenic effects of mobile communication-related electromagnetic fields. It was a pertinent and very timely hot-topic that all members wanted to know about. This meeting also had the student flash poster sessions which gave them the opportunity to enhance their presentation abilities in a challenging 2 minute-format in front of many members, before presenting their work in more depth at the poster sessions. Another pertinent issue was discussions of merging the two societies, BEMS and EBEA. At the BEMS Annual Business Meeting and the EBEA General Assembly in Asilomar, 2015 we agreed to set up an ad-hoc joint EBEA/BEMS committee to investigate possible scenarios for merging the societies. Both societies had a merger survey before the BioEM2016 meeting, and decided to have a “BEMS-EBEA Merger Meeting” in Ghent on the Thursday afternoon. At this Merger Meeting, a lot of words and ideas were put forward, with people mainly expressing their opinion on the different ‘merger options’ but no concrete suggestions for new ideas were presented due to the limited time. Due to this, the societies will now open a joint blog in order for members to further discuss the issue, and for members who could’nt attend the BioEM2016 meeting. Finally, we deeply thank our sponsors: EPRI, MMF, KIEES, Pulse Biosciences, ZonMw, and GSMA, for helping to make BioEM2016 a wonderful and successful meeting. See you next year in Hangzhou, China!! 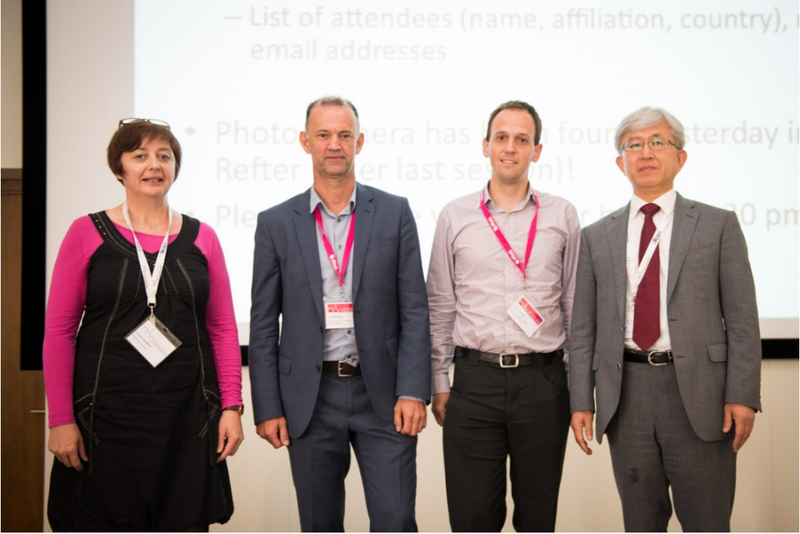 EBEA President Isabelle Lagroye (left) and BEMS President Nam Kim (right) thanking LOC chair Luc Martens (second left) and co-chair Wout Joseph (second right).